While driving through my old stomping grounds in Springfield Township, Ohio today to meet my father for our usual mid-week lunch at our favorite Chinese place, I was aghast to see that the last of my old Ohio offices had finally been torn down. This wasn’t just any old office — it was the one where most of the production of my first feature film, THE DEAD NEXT DOOR, was staged, circa 1986-1987. I couldn’t resist stopping to grab a quick photo of the now-empty lot on my iPhone today, similar to an old shot of the back entrance to the building from that era, which you can see side by side above — and that got some old memories coming back. But let’s start at the beginning: My first office was actually the basement of an empty house my grandmother owned in Ellet, a suburb of Akron, Ohio. It overlooked Interstate 76 and was the site of more than one minor accident because the driveway was practically on top of the street. 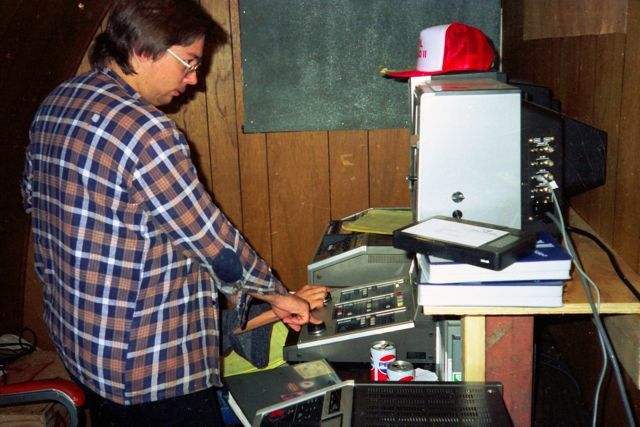 Most of the prep work for THE DEAD NEXT DOOR was done at that location, where I spent many long nights writing and rewriting the script on an old Brother electronic typewriter (ah, those were the days!). We even did our casting in that office, using the garage (?!) as our little stage. Because winter was fast approaching, the project wound up being delayed into the spring. By now the film had expanded beyond my original intentions, with literally thousands of Northeast Ohio residents signing up to play zombie extras or cult members thanks to a tsunami of local press which included newspapers, radio and television. For that reason, I started looking for a new office with a little more space, which is when I stumbled across 1203 Canton Road in Springfield Township around February, 1986. As you can see from the left-hand side photo of the rear of the building taken that same year, the building was an old military bunker-style Quonset hut design. The top floor was a video store (ironically), but we were able to rent the basement for cheap and that became the new Amsco Studios (the precursor of Tempe Entertainment). Since the basement was just one wide-open room, my old school chum we lovingly referred to as “Spud” was drafted into putting up some threadbare drywall walls so we could at least have a few small offices, a meeting room and some storage for props & wardrobe. It wasn’t much, but we called it home. 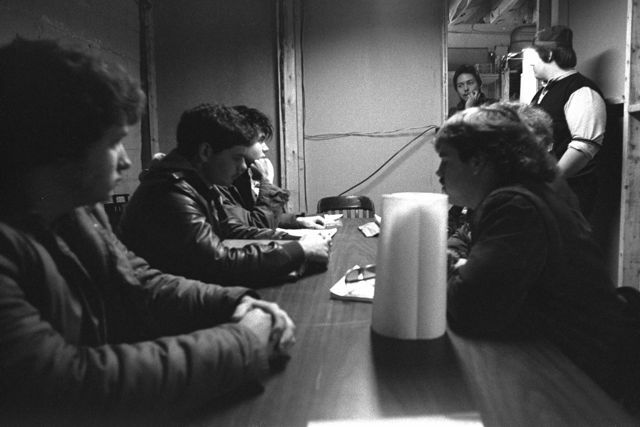 Holding a DEAD NEXT DOOR production meeting, circa 1986. By a stroke of fate, sometime that spring, the video store above us closed up shop and we were able to secure rental of the entire building. This was a godsend, because the high, rounded ceiling and big open space once occupied by the video store meant that we had just enough room to actually build a single set — complete with lights mounted above and a backdrop. It was suddenly like a real Hollywood production! There were also a few more rooms toward the back of the top floor, which we put to use for our burgeoning collection of props & wardrobe as well as eventually a space for the 3/4″ editing system the movie was cut on. Our faux soundstage, which production designer Jon Killough (with some help from a host of others) did a smashing job of constructing, actually became three sets in one (or technically, four, if you count the same one twice). The main use was for the inside of the farmhouse bedroom at the beginning of the film where Scotty Spiegel meets his maker. I had the crazy idea to use a zombie puppet head on a real person’s body, which necessitated us cutting a hole in the wall for that person’s real head to stick out of — no way we could pull that off on location. After we wrapped the farmhouse bedroom set, Jon reworked it as the inside of Dr. Bow’s shed laboratory, then again as the cult member’s security room and armory. In the upstairs of the old office, working on DEAD NEXT DOOR editing. For all intents and purposes, I basically lived at that office — I’d go back to my parents’ house to sleep, but every waking moment beyond that was spent at that office, which we occupied from early 1986 until sometime the following year, when I found another ramshackle storefront available for about the same money just up the street. So when I saw that office torn down today, it was kind of a somber moment for me. A flood of memories came back, both good and bad, from the bygone, carefree days of making THE DEAD NEXT DOOR. Heck, I’m not even ashamed to confess that my girlfriend (later wife, still later ex-wife) and I even blossomed and later “consummated” our relationship at that office — but you don’t need any more sordid details on that subject. It’s sort of ironic — all four of the offices that I had in Ohio have now been razed, as I realized this morning! The city bought my grandmother’s house where the first office was located and tore it down many years ago to widen the street. My third office in Springfield Township (where we did reshoots and completed most of the post work on DEAD NEXT DOOR) was torn down as well and remains an empty lot to this day. Even my fourth office in Mogadore, Ohio (1989-1990) was torn down to make way for a Hungry Howie’s Pizza and a Subway. (I finished ROBOT NINJA there and shot a chunk of SKINNED ALIVE as well.) The Quonset hut office was the last man standing, and that is now gone as well. This entry was posted on Wednesday, March 31st, 2010 at 4:36 pm	and is filed under Announcements, Movies, Random Thoughts, Tempe Entertainment. You can follow any responses to this entry through the RSS 2.0 feed. Both comments and pings are currently closed. This is awesome. Dead Next Door was one of my favorite movies. I mean that sincerely. To find out it was made just down the road from me makes it even more endearing.